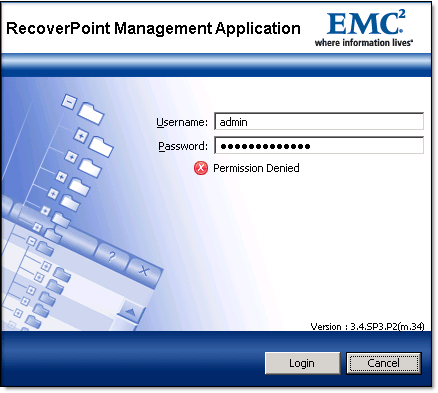 EMC RecoverPoint might not be the equipment you login to every day and, unless you have meticulously documented RecoverPoint installation and config, you may find yourself in a situation when you cannot login to RecoverPoint. What if you 100% sure that the password you use is correct but it still does not work? It is a good practice to configure and use separate RP accounts for application like VMware SRM or Replication Manager. Check if you can login with one of those accounts and reset admin’s password. If it does not work – see next step. Login as RecoverPoint 'security-admin'. The password is also 'security-admin'. Disclaimer: These instructions are valid for RPA software version 3.4 (SP3) and might be different for other versions.